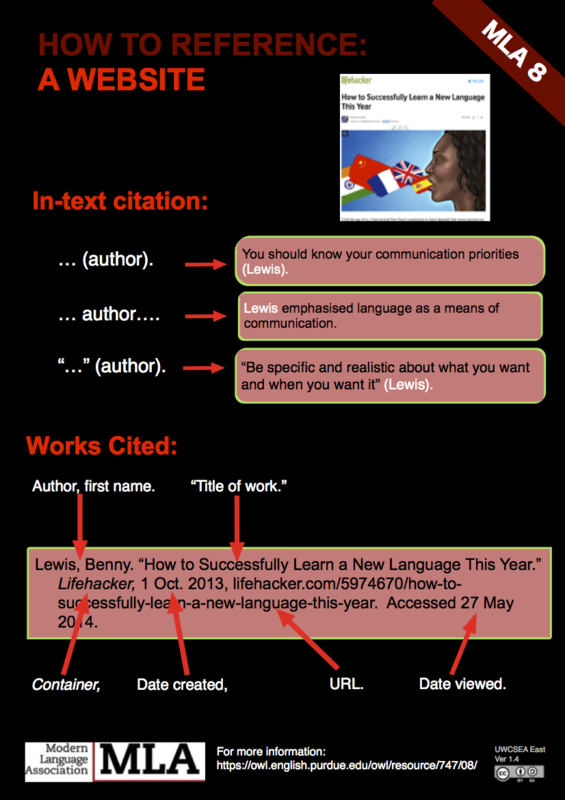 MLA (short for the Modern Language Association) is the default formatting style for referencing at our school. The latest version MLA 8 came out in 2016. 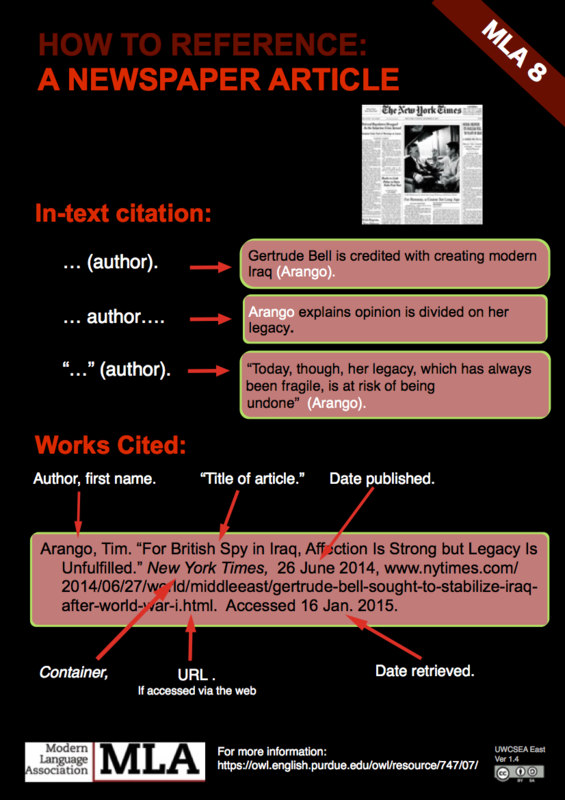 For an introduction to referencing, see the HS Research Help: Citing Sources webpage. For very specific questions, see the MLA Handbook in our library. Below are some books in the library on referencing. Click here for a full list in the catalog. 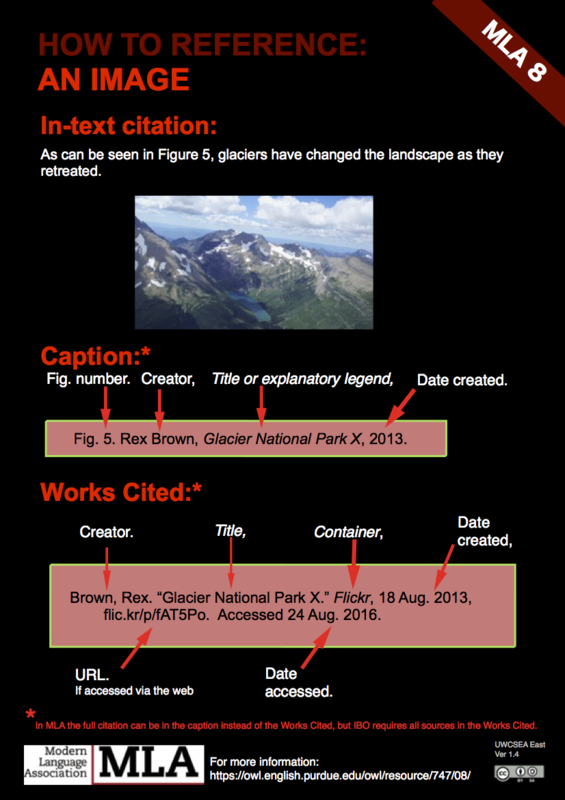 Cite any information source, from ancient texts to Twitter - Examples are given in Harvard, APA, MHRA, MLA, OSCOLA and Vancouver referencing styles. 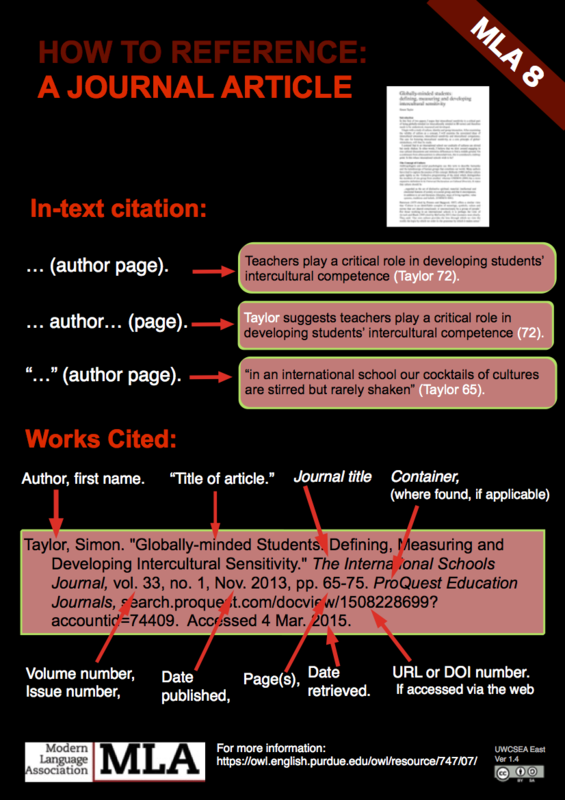 Guidance on what is plagiarism and how to avoid it. We have multiple copies of this book. A comprehensive manual that provides the MLA, APA, CSE, AMA, ACS, "Bluebook," ALWD, and AAA styles of citation. Presents a comprehensive guide to help write, research, and cite sources; with tips on MLA, APA, CMS, and CSE writing styles. 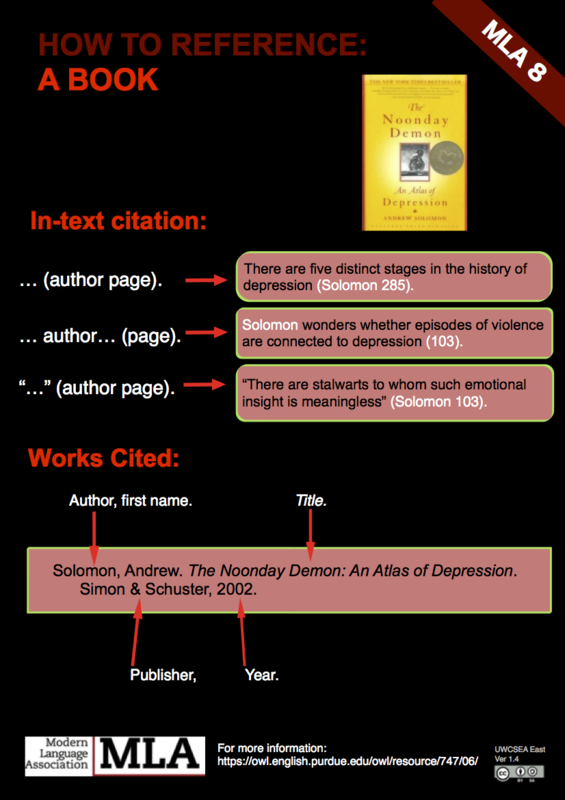 The writing excerpt below uses inline citations to point to information sources taken from the bibliography beneath. Americans in 1976 consumed an average of 91.5 pounds of beef per year; today that figure is down to 54 pounds (Kunzig). The UK is about the same, with an average per person consumption of 56 pounds of red and processed meat annually ("Great Meat"). The health danger with eating red meat comes from the high levels of saturated fat. Vegetarians may feel virtuous, but they should realize that cheese has higher levels of saturated fat than hamburgers (Smith 54). There are vigorous debates in the scientific community about how much red meat is bad for your health, but all seem to agree that processed meat (bacon, ham, salami, etc.) is definitely worse than unprocessed ("Great Meat"). Kunzig, Robert. "Carnivore’s Dilemma." National Geographic Society, 2014. <http://www.nationalgeographic.com/foodfeatures/meat/>. Accessed 21 Oct. 2014. Smith, Janine. The Argument against Beef. New York: Brand Books, 2012. "The Great Meat Debate". BBC News. British Broadcasting Corporation, 17 July 2014. <http://www.bbc.com/news/health-285e6706>. Accessed 22 Sept. 2014. 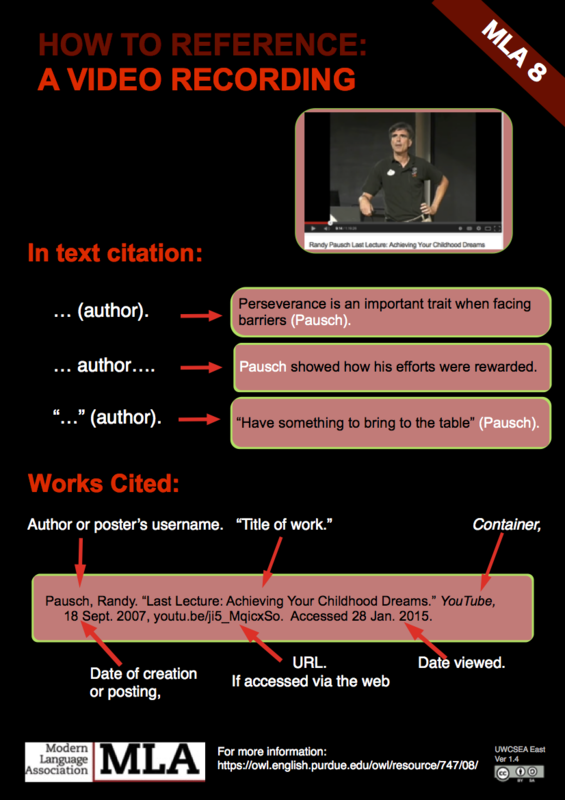 One of the best guides to the MLA style of referencing is the Purdue University OWL site. The University of Wisconsin Writing Center is also very useful.